Making unique projects has never been easier with these specialty paper. Welcome to MyBinding video. 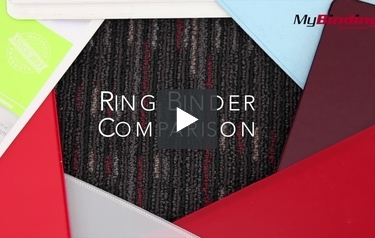 This is a ring binder comparison and hopes to help you decide which type of binder is best for you. We’ll be showing you 7 different types of Wilson Jones and Acco binders. First is the clear translucent Poly Binders. This is a flexible 3-ring see through binders and it’s got 2 pockets on the inside. It’s not impossible to fit an 8 ½ x 11 sheet in the pocket but smaller pages fit much easier. And this one has tabs on the side to open your rings. Next is the Basic Opaque Round Ring Binders. They’re a harder cover with 2 pockets on the inside. This one also has a standard 3-ring system. This is a Semi-Rigid ACCOHIDE Ring Binders. It’s a flexible plastic and has no pockets. It simply protects your pages within the binding and as expected, it has a standard 3-ring system. This is a Heavy Duty Hanging Vinyl Binder. It has a hard cover and two pockets on both insides. The overall is even a little more professional and like the others, it has tabs on the side to open the rings. This one even has a label tab on the outside. Pull out both the black tabs and you can even hang it in a file index cabinet. Next is a Non-Stick Flexible Binders. They have one pocket on the inside which is easily accessible. There’s even a little slot for a business card. It’s got tabs on the side to open the rings. You can insert a cover page on the front and side. Next up is the A4 International Binders. They have 4 rings and open only by pulling the rings. It has pockets on all sides. It’s specifically made to fit larger size international pages and it’s got a clear cover on the front side and the back. Lastly is the PRESSTEX Ring Binders. This one is like a more fancy and durable cardstock. It’s simply there to protect your pages. It’s got your basic 3-ring system. There are a few different options of what’s out there in the ring binding world. There are binders that fit different purposes, prices, colors, you name it. Hopefully this will help you decide what’s best for you and your needs. There are a few more things to keep in mind when choosing the right binder. As always, for more demos, reviews and how-to’s, go to MyBinding.com.